Here are the Moda Blockheads blocks that are on my design wall. I'm still very far behind but feel a little closer than I was two weeks ago. They have posted 28 blocks and I now have 20 of those done. I skipped one of the first blocks I'll have to go back and make. The Buckeye Beauty block I've actually made three times. The first time it was blue. it quickly became obvious that blue was not going to fit in this quilt even if it is scrappy. I didn't like the second one I made and I'm not sure about the third but I'm not making it again even if it is an easy block. 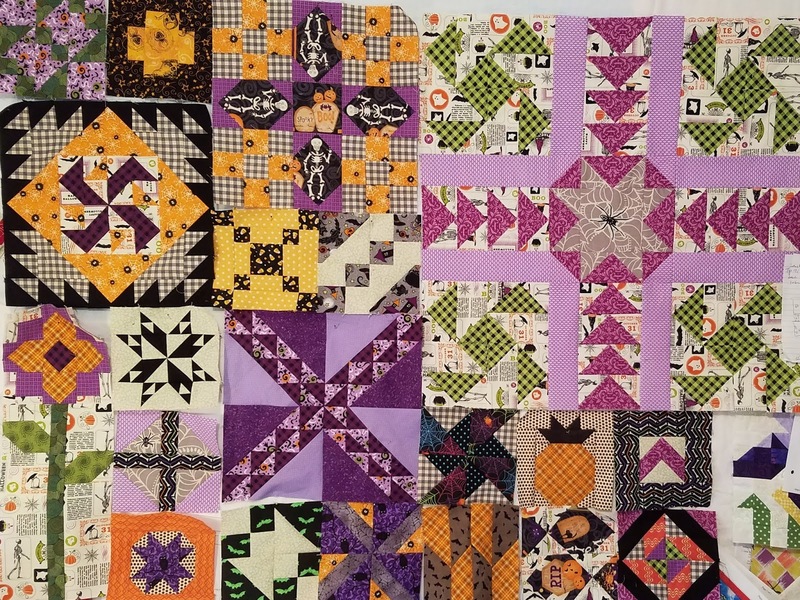 There is a iris block on the bottom right that does not belong with these but I haven't made enough blocks to cover it up yet. Yes, there are a few blocks for other projects lurking underneath these. It was time to change the quilt on my bed so I decided to take a before and after picture. 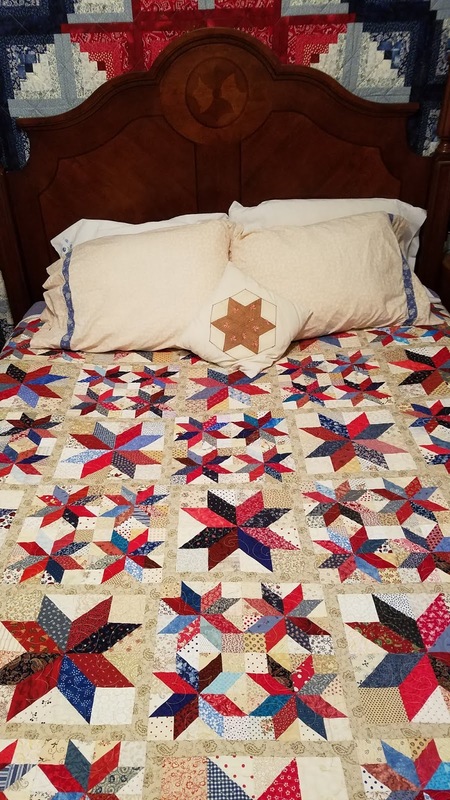 The little star block pillow was made from some blocks my great grandmother made. My sister Joyce and I put those together probably 25 years ago. 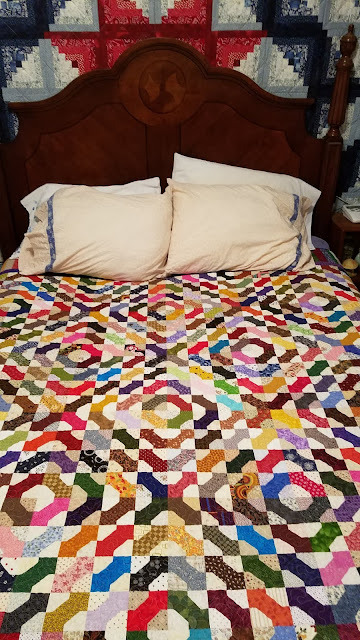 Mom was so mad we wasted those blocks on those pillows but I've enjoyed seeing and knowing that the block is a piece of my quilting history so I don't feel a bit bad about it. This bowtie quilt is one of my favorites. It ends up on my bed more often than any other quilt. I'm planning to spend some time with the grandkids this weekend. Tonight we're going to hang out while their mom and dad go on date night to a play. Saturday may be the day Grace and I start working on a project together. We shall see. 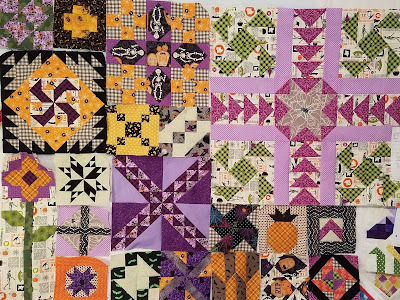 Love your bed quilts - so bright and bold! The Star is my favorite!